After years of having a bizarre and tremendously flexible schedule (thank you grad life), I now find myself in the position of having a fairly regular hours job. This means that I don’t generally have a lot of time to make lunches, so I’ve taken to trying to make big meals that yield tasty leftovers that I can use for lunch throughout the week. Lasagna is always a favourite of mine, but I wanted to try to find a new variation on a theme. 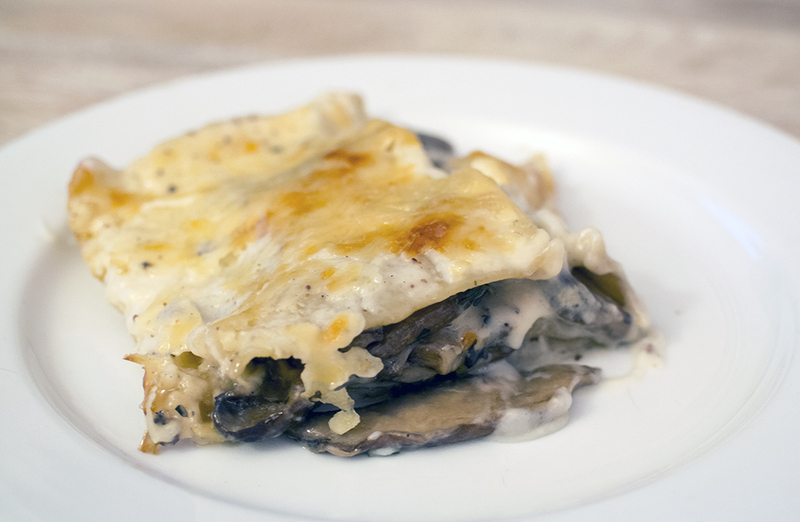 Mushrooms and béchamel sauces are definitely a weak spot, so this recipe seemed to be perfect. And what do you know, me making a vegetarian lasagna! Wait, is that a cow I see making a lunar trajectory? Preheat oven to 375 F. Lay lasagna noodles in 8 x 12 x 12″ baking dish and cover with warm water. Let stand for about 20 minutes or until noodles are soft. Drain noodles. For white sauce, bring milk to a simmer in a saucepan and set aside. Melt 1 stick (8 tbsp) of butter in a large saucepan. Add flour and cook for 1 minute over low heat, stirring constantly. Pour the hot milk into the butter-flour mixture all at once. Add 1 tbsp salt, pepper and nutmeg and cook over medium-low heat, stirring with a whisk for about 3-5 minutes, until thick. Set aside. Separate mushroom stems from the caps and discard stems. Slice the caps about 1/4″ thick. Heat 2 tbsp oil and 2 tbsp butter in a a saute pan. Add half the mushrooms, sprinkle with salt and cook over medium until tender and they release some juices. Add more oil if the pan becomes dry. Repeat with remaining mushrooms. To assemble lasagna, spread some of the sauce in the bottom of the baking dish. Arrange a layer of noodles on top, followed by a layer of sauce and 1/3 of the mushrooms and a 1/4 of the cheese. Repeat 2 more times (layering noodles, sauce, mushrooms and cheese). Top with a final layer of noodles and sauce, and sprinkle with the remaining Parmesan. Bake for 45 minutes or until the top is browned and the sauce is bubbly and hot. Allow to sit at room temperature for 15 minutes before serving. A few notes on preparation: I had about 12 oz of Portobello mushrooms, so I supplemented with some brown mushrooms as well. Also, I used a combination of Parmesan, Asiago and Romano cheeses instead of just Parmesan. So…yum! I have always been a sucker for a béchamel sauce, and this was no exception. The portobello mushrooms provided such great body and flavour to the dish, complemented well by the copious amount of nutmeg. I could easily see adding in spinach or other vegetables to fill it out, though I thoroughly enjoyed it with just the mushroom. It also made fantastic lunch leftovers for several days in a row. Earmarking this one for future consumption!